General Hospital (GH) recapfor Friday, October 19, 2018 reveals, Sonny (Maurice Benard) tells Jason (Steve Burton) he went to visit Drew (Billy Miller) to try and get a feel on how he will react to the Margaux (Elizabeth Hendrickson) situation. Sonny tells Jason he’s not sure what Drew will do, but he’s in a position to take him from his family. Sonny says Drew didn’t say he would have his back. Jason says it doesn’t matter because Margaux isn’t taking him down. Jason says this vendetta makes no sense. Sonny tells Jason that Margaux isn’t thinking rationally. Spinelli’s (Bradford Anderson) research shows that Marino was moving up in the foundation. Jason says that doesn’t matter; Sonny says Margaux isn’t going to believe that. Sam (Kelly Monaco) walks in and tells Sonny and Jason that when she’s finished with Margaux, she will have to. Sam brings the information to Sonny and Jason, Spinelli forgot to tell them he gave Sam the case. Sonny and Jason are glad Sam is on the case. Sonny goes upstairs to see Avery (Ava and Grace Scarola) before going over the evidence. Sam asks if Sonny knows about Oscar, Jason says no. Jason asks Sam if she’s talked to Drew (Billy Miller), she tells him he stopped by and talked to her. Jason tells Sam about his visit with Monica (Leslie Charleston). Jason is surprised that Spinelli didn’t tell him he was going away. Sam tells Jason that Spinelli is matchmaking again. Jason tells Sam that Spinelli said he would stop. Sam tells Jason that Spinelli believes in them and thinks they belong together. Sam tells Jason that Spinelli is pushing. Sam says Spinelli is like a child and won’t listen. Sam is frustrated, and she wants Spinelli to know they aren’t ready to be together yet. Sonny asks what they want to make clear. Sam shows Sonny a picture of Margaux’s mom; she was having an affair with Scully (Robert Miano). General Hospital’s T.J. (Tequan Richmond) eats with Jordan (Briana Nicole Henry) and Curtis (Donnell Turner); they discuss the reception on the Haunted Starr. Curtis tells T.J. he refuses to put his life on hold until Stella (Vernee Watson) comes around. Jordan and Curtis tell T.J. everything they have tried to do to get Stella to come around. T.J. asks if Curtis can live with that. Curtis says Stella was a mother to him, but her grief is misplaced. Jordan hates being the cause of the distance between Curtis and Stella. Curtis says the wedding is off. Curtis tells Jordan that is the only other option. Curtis says all he can do is tell Stella he loves her and then marry Jordan. T.J. offers to talk to Stella himself. T.J. believes he is the only person who has a chance to talk to Stella. T.J. asks Stella about the wedding. T.J. asks if any of the babies are as cute as he was. Stella tells T.J. that he’s the best thing that came from this whole mess. Jordan wants Stella to find or refind love. 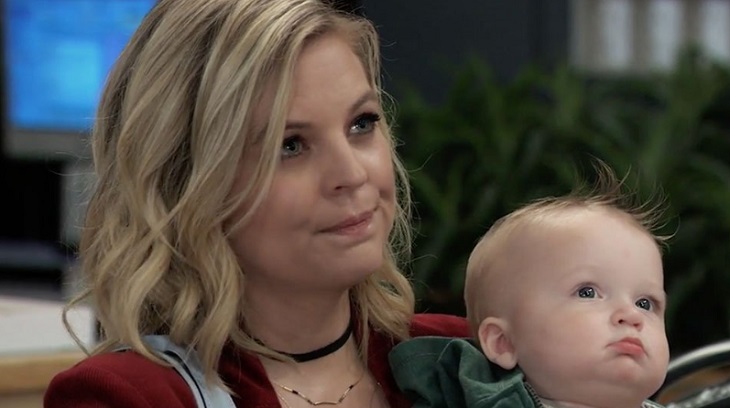 General Hospital’s Peter (Wes Ramsey) joins Maxie (Kirsten Storms) and James and visits with them. Peter holds James; he likes being Uncle Peter. Peter says the family is what he has been missing his whole life. Peter says that James smiles just like his dad. Maxie notices a rash and panics. Maxie arrives at the hospital with James and Michael (Chad Duell) has a doctor paged for her. James’ pants were just too tight. Michael encourages Maxie to hang in there. General Hospital’s Drew meets with Margaux. She’s not surprised he reconsidered, he’s trying to figure out why he hasn’t called the cops. Drew tells Margaux she is knowingly holding on to stolen property. Margaux tells Drew this is impossible to prove because he has no proof that she has the flash drive. Margaux tells Drew it’s his word against hers. Margaux tells Drew this is the only way she has to bring Sonny down. Margaux claims that her father was a good man and it wasn’t fair that he isn’t there. Drew tells Margaux that her father made a choice, Margaux argues that her father made a mistake. Margaux says her father was a ticket to Sonny’s promotion. Margaux says she will never get justice for her father, but she can still nail Sonny to the wall with his help. Drew refuses to help Margaux. Drew tells Margaux he isn’t protecting Sonny or Jason and won’t be the reason Danny loses his father. Drew has to do what is better for himself. Drew tells Margaux he’s not giving up the life he has built for himself for his past. Drew tells Margaux to trash or burn the flash drive because it’s irrelevant. Margaux says she will hold onto the flash drive because someday he will want it. General Hospitals’ Stella sees Michael watching the babies in the nursery and approaches him. Michael asks Stella to stay. Stella tells Michael that she has fallen into the same grief trap and wishes she hadn’t. Michael tells Stella that he never made it to the sessions. Michael assures Stella that he grieves. Michael talks about going to Jonah and Morgan’s graves. Michael visits the nursery a lot, and it helps. Michael tells Stella how much holding Wiley comforts him. Stella tells Michael he would be a good social worker.